Located at the southern end of South America (it’s shared by Chile and Argentina), Patagonia is a region of dramatic mountain ranges, smoky volcanoes, expansive ice fields, and vast plains known as the Pampas. Here, you’ll find the well-known Torres del Paine National Park as well as world-class trekking routes that will take you through ancient forests, past glaciers and fjords, and along picturesque mountain lakes. Patagonia is also home to incredible wildlife; look for guanacos, flamingos, condors, foxes, and pumas. 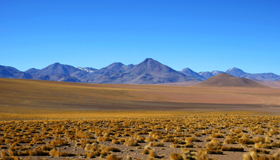 Northern Chile’s Atacama desert is the driest on earth and features a surreal landscape. Here, you’ll find sand dunes, blue lagoons, deep canyons, salt basins, and incredible rock formations. Well-known landmarks include El Tatio (one of the world’s largest geyser fields), the Atacama salt flat (home to flamingos) and Valle de la Luna, which is known for its incredible desert sunsets. Travelers can explore Atacama’s lunar-like landscape on foot, visit indigenous villages, sandboard down dunes, and hunt for cave paintings. The most isolated inhabited isle in the world, Easter Island sits 3,700 kilometers (2,295 miles) off Chile’s Pacific coast. 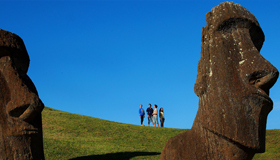 A semi-tropical destination that’s best known for the hundreds of stone figures (called moai) its Rapa Nui populace carved centuries ago, Easter Island also offers a rocky coastline, picturesque beaches, rolling hills, volcanoes, and a crater lake. Much of the island is part of Rapa Nui National Park, a UNESCO World Heritage Site. Situated on a long, thin stretch of land that’s nestled between the Andes Mountains to the east and the Pacific Ocean to the west, Chile is home to an incredibly diverse array of terrain. To the north, you’ll find a desolate landscape of sand dunes, canyons, and flamingo-dotted lagoons. In the Central Valley, you’ll hit the fertile soils of wine country and the cone-shaped volcanoes, hot springs, and azure waterways of the Lake District. 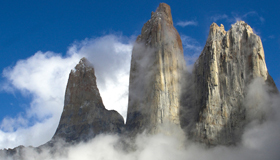 Continue south for the glaciers and tall peaks of Patagonia. Watch a few of our stunning videos! Need expert travel advice? Get in contact, we’re here to help you!